I don’t think they’ll make a third Percy Jackson movie but at least you can still read the books! Also known as Percy Jackson & the Olympians, the book series by Rick Riordan is about a young man who, as you may have guessed, is called Percy Jackson. One day, after being attacked by a Minotaur, Percy discovered that he is a demigod, the son of Poseidon, the Greek god of the sea. His life changes completely as he finds himself at Camp Half-Blood, a training camp for demigods like him. Soon, with his companions, a Satyr named Grover Underwood and Annabeth Chase, a daughter of Athena, Percy starts a grand adventure. In the Percy Jackson series, we have the main Percy Jackson & the Olympians series, but also sequel series, short stories and more. For some, it’s hard to know where to put them chronologically. So, here is a way to go. The Lightning Thief – Percy Jackson could have sworn his pre-algebra teacher turned into a monster and tried to kill him. When Percy’s mom finds out, she knows it’s time that he knew the truth about where he came from. She sends Percy to Camp Half Blood, a summer camp for demigods where he learns that the father he never knew is Poseidon, God of the Sea. The Sea Of Monsters – Percy discovers that the magical borders which protect Half-Blood Hill have been poisoned. Now he and his friends-Grover, Annabeth, and Tyson-must retrieve the Golden Fleece from the Island of the Cyclopes by the end of the summer or Camp Half-Blood will be destroyed. The Titan’s Curse – When the goddess Artemis goes missing, she is believed to have been kidnapped. And now it’s up to Percy and his friends to find out what happened. Who is powerful enough to kidnap a goddess? The Battle Of The Labyrinth – As an incoming freshman, Percy isn’t expecting his high school orientation to be any fun. But when a mysterious mortal acquaintance appears, followed by demon cheerleaders, things quickly move from bad to worse. The Last Olympian – All year the half-bloods have been preparing for battle against the Titans, knowing the odds of victory are grim. While the Olympians struggle to contain the rampaging monster Typhon, Kronos begins his advance on New York City. Now it’s up to Percy Jackson and an army of young demigods to stop the Lord of Time. The Demigod Files – It is a collection of stories set during the Percy Jackson & the Olympians series written by Rick Riordan. Percy Jackson and the Singer of Apollo – Another short story. You can read it later if you want. The Heroes of Olympus is a sequel series in 5 books. 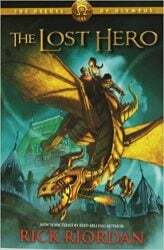 The Lost Hero – Jason doesn’t remember anything before waking up on a school bus holding hands with a girl. Apparently she’s his girlfriend Piper, his best friend is a kid named Leo, and they’re all students in the Wilderness School, a boarding school for ‘bad kids.’ What he did to end up here, Jason has no idea-except that everything seems very wrong. The Son of Neptune – Percy is confused. When he awoke after his long sleep, he didn’t know much more than his name. His brain-fuzz is lingering, even after the wolf Lupa told him he is a demigod and trained him to fight. Somehow Percy managed to make it to the camp for half-bloods, but the camp doesn’t ring any bells with him. The Mark of Athena – The Greek and Roman demigods will have to cooperate in order to defeat the giants released by the Earth Mother, Gaea. Then they will have to sail together to the ancient land to find the Doors of Death. What exactly are the Doors of Death? Much of the prophecy remains a mystery. 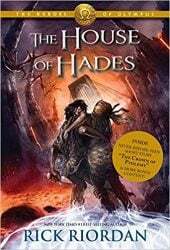 The House of Hades – The five demigods have to put aside their grief and follow Percy’s instructions to find the mortal side of the Doors of Death. If they can fight their way through Gaea’s forces, and Percy and Annabeth can survive the House of Hades, then the Seven will be able to seal the Doors from both sides and prevent the giants from raising Gaea. The Blood of Olympus – The Athena Parthenos will go west; the Argo II will go east. The gods, still suffering from multiple personality disorder, are useless. How can a handful of young demigods hope to persevere against Gaea’s army of powerful giants? As dangerous as it is to head to Athens, they have no other option. They have sacrificed too much already. And if Gaea wakes, it is game over. 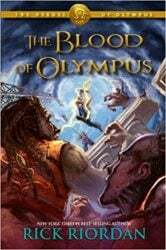 The Demigod Diaries – It is a collection of stories set during The Heroes of Olympus series written by Rick and his son Haley Riordan. Based on the Egyptian mythology, The Kane Chronicles is set in the same universe than the other series, but follows Carter and Sadie Kane, powerful magicians and descendants the two pharaohs Narmer and Ramses the Great. The Red Pyramid – Since their mother’s death, Carter and Sadie have become near strangers. One night, Dr. Kane brings the siblings together for a ‘research experiment’ at the British Museum, where he hopes to set things right for his family. Instead, he unleashes the Egyptian god Set, who banishes him to oblivion and forces the children to flee for their lives. The Throne of Fire – In this exciting second installment of the three-book series, Carter and Sadie, offspring of the brilliant Egyptologist Dr. Julius Kane, embark on a worldwide search for the Book of Ra, but the House of Life and the gods of chaos are determined to stop them. The Serpent’s Shadow – Despite their best efforts, Carter and Sadie Kane can’t seem to keep Apophis, the chaos snake, down. Now Apophis is threatening to plunge the world into eternal darkness, and the Kanes are faced with the impossible task of having to destroy him once and for all. This is a Camp Half-Blood/Kane Chronicles crossover series of short stories. 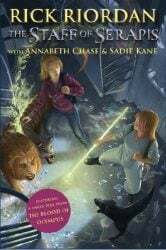 The Staff of Serapis – Annabeth encounters more oddities in the subway than usual, including a two-headed monster and a younger blond girl who reminds her a little of herself. The Crown of Ptolemy – Trouble is brewing again, this time on Governor’s Island. An ancient Egyptian magician named Setne has come back from the dead and is experimenting with Egyptian and Greek magic, trying to become a god himself. The Trials of Apollo is a sequel series that follows the trials of the god Apollo, who has been turned into a human as punishment from his father and king of the gods Zeus. You can read this trilogy before or after the “Magnus Chase and the Gods of Asgard” one. The Hidden Oracle – After angering his father Zeus, the god Apollo is cast down from Olympus. Weak and disoriented, he lands in New York City as a regular teenage boy named Lester. Now, without his godly powers, the four-thousand-year-old deity must learn to survive in the modern world until he can somehow find a way to regain Zeus’s favor. The Dark Prophecy – After experiencing a series of dangerous trials at Camp Half-Blood, Lester must now embark on a hair-raising journey across North America. Somewhere in the American Midwest, he and his companions must find the most dangerous Oracle from ancient times. The Burning Maze – With the help of some demigod friends, Lester managed to survive his first two trials, one at Camp Half-Blood, and one in Indianapolis, where Meg received the Dark Prophecy. The words she uttered while seated on the Throne of Memory revealed that an evil triumvirate of Roman emperors plans to attack Camp Jupiter. While Leo flies ahead on Festus to warn the Roman camp, Lester and Meg must go through the Labyrinth to find the third emperor. Magnus Chase and the Gods of Asgard is another sequel series. This one follows Magnus Chase, a new demigod is born—this time from Norse mythology. He is a homeless boy from Boston trying to discover his true identity. The Sword of Summer— Ever since that terrible night two years ago when his mother told him to run, Magnus Chase has lived alone on the streets of Boston. One day, he’s tracked down by an uncle he barely knows. Uncle Randolph tells him an impossible secret: Magnus is the son of a Norse god and the gods of Asgard are preparing for war. To prevent Ragnarok, Magnus must search the Nine Worlds for a weapon that has been lost for thousands of years. The Hammer of Thor—Thor’s hammer is missing again. The thunder god has a disturbing habit of misplacing his weapon—the mightiest force in the Nine Worlds. But this time the hammer isn’t just lost, it has fallen into enemy hands. If Magnus Chase and his friends can’t retrieve the hammer quickly, the mortal worlds will be defenseless against an onslaught of giants. The Ship of the Dead—Loki is free from his chains. He’s readying Naglfar, the Ship of the Dead, complete with a host of giants and zombies, to sail against the Asgardian gods and begin the final battle of Ragnarok. It’s up to Magnus and his friends to stop him, but to do so they will have to sail across the oceans of Midgard, Jotunheim, and Niflheim in a desperate race to reach Naglfar before it’s ready to sail. 9 From the Nine Worlds—After The Magnus Chase and the Gods of Asgard trilogy has concluded, join Hearthstone, Blitzen, Samirah, Alex, Jack, T.J., Mallory, Halfborn, and more on an unforgettable journey. While Magnus is off visiting his cousin, Annabeth, his friends find themselves in some sticky, hairy, and smelly situations as they try to outwit moronic giants, murderous creatures, and meddlesome gods. Can they stave off Ragnarok at least until Magnus gets back? These books should be read after you’ve read all of the main books. Hotel Valhalla: Guide to the Norse Worlds—This “who’s who” guide to the gods, goddesses, and other important figures of Norse mythology was commissioned by Helgi, who, after more than a millennium as manager of Hotel Valhalla, became fed up with answering the same questions from newly deceased heroes at check-in. The Princess Diaries Books in Order: How to read Meg Cabot Series? Spider-Man by Dan Slott Reading Order: How to read the longest run in Spidey’s History? This comment is completely off topic but I saw on this page that there would not be a third movie in the Percy Jackson series and I’m absolutely relieved that there won’t be. I’m a die-hard fan of all the Rick Riordan books and series but three movies were SO changed from the books that it made me extremely annoyed. Firstly, the prophecy concerning hugs 16th birthday wad changed to 20 (ugh). And in the “Sea of Monsters” movie Kronos materializes at the end?! Maybe they knew there were no more movies being filmed so they just included all the interesting parts from books through . who knows. Terrible and disappointing for sure. Talk about Harry Potter. Movies vs Books. I agree strongly. I asked all my friends that watched the movie if they enjoyed it, and they all thought it was terrible! My friends and I have read all the books of the greek gods and all the series. I was extremely disappointed that the movie was horrifying, because I am in love with the books and as I read I can picture a movie in my head. I am also sad because I think if they worked on the movie a little more, than it would be a magnificent movie, and people would probably enjoy it. Just yesterday I was on youtube looking for the old trailers of the movies, and I saw a lot of hate comments. A ton of people were annoyed and very disturbed by the video and asking for the creators to take it down. And my last reason on why I am disappointed, people who have seen the movie and think it was terrible do not want to read the books! They think it will give the same annoying story they had while watching it. Also I recommend the books! in the books originally her hair is blond! dang, girl. I’m huge huge huge on Percy Jackson. The movies are horrible, but I guess they could be worse. (sadly that’s not very assuring, though.) keep loving the series. personally I like the Heros of Olympus a lot better than than Percy Jackson and the Olympians. Where is Greek gods ??? I made an update. I just added the Magnus Chase series and the companion books. For Magnus Chase, I put it after The Trials of Apollo, but you can read it before. Cool your beans! He tried! Thanks a lot ..It’s really great ..Umma die-hard fan of Rick with respect to books ..I love Percy…soooooo much..
Quick question. Do I have to read The Kane Chronicles series first before I read the trials of Apollo?? No! You should read it! Even though it’s about the Egyptian gods, instead of the Greek ones, it has a great storyline. And the crossover between Kane chronicles and pjo wouldn’t make sense. Thank you!! This helped me a lot! Plz answer. Do u hv to read Kane Chronicle and the one after it b4 reading Trials of Apollo? I love all Rick Riordan books, but they really need to make one of the Roman background on Jason and stuff or Rick Riordan could make another book on how Jason helps the minor gods, and how Percy and Annabeth live there lives in new Rome, that’s just what I think. I also think this website was very helpful. Speaking of books in order, always read any serie of Books in order, no matter what. And also, do I have to read the heroes of Olympus after Percy Jackson because I just started the heroes of Olympus books when I’m still reading Percy Jackson and the lightning thief-Percy Jackson and the sea of monsters. Please answer!! Also I didn’t know that Rick Riordan also wrote about Egyptian gods, cuz I only know the Greek gods and the Roman gods, and plus I’m not interested in the Egyptian gods at all. You DEFINITELY need to finish Percy Jackson and the Olympians before Heroes of Olympus. Heroes of Olympus is pretty much a direct continuation of the pjo series. They are both really good and worth the wait. you know what i dont need to watch movies.i prefer reading the books cause i can picture the scene in my mind itself and its fantastic.though i have seen the first two movie. Where are the Demigod Files and Demigod Diaries? Thanks a lot!!! I am very gratefull to you!!!! Thanks one last time!